Women Leaders Conference > How to Achieve Professional Goals by Protecting Your Personal N.E.S.T. 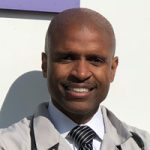 Dr. Hampton is especially passionate about removing barriers to health and equipping patients and his colleagues with the education and resources they need to take charge of their own health. As medical director of the Advocate Operating System, he collaborates with clinicians and staff on programs to address social determinants of health among at-risk patient populations. For example, for the Healthy Living program, he develops education around nutrition and weight loss that help patients set realistic and attainable goals. He’s also an ambassador for the program, encouraging his physician colleagues to refer their patients. The same goes for the AdvocateCare Center (a place where patients receive multidisciplinary care in one visit), encouraging his colleagues to utilize the Center as a partner to help them manage their patients with multiple chronic diseases and improve their quality of life. He has also been instrumental in the launch of the Food Farmacy (that’s FARM-acy with an “F”) at Advocate Trinity Hospital to increase access to fresh, healthy food for patients and community members in need in partnership with the Chicago Food Depository. Dr. Hampton is a board-certified obesity specialist, working with patients individually in the clinic and with small groups enrolled in the diabetes prevention program (DPP). As one of only 2,650 board-certified obesity medicine specialists in the United States, he’s been able to use his knowledge to help develop and support programs that reduce the obesity burden. He has participated in novel research, serving as the lead researcher for the Merck/Premiere-sponsored trial where he worked in collaboration with other thought leaders to develop a point-of-care tool to be used by frontline physicians to improve diabetes care using patient data. In addition, he uses his experience as clinician leader within oneof the largest health systems and highest performing accountable care organizations in the U.S., Advocate Health Care, to provide input to all research phases and to guide data collection and management for the project. He is a tireless leader and cheerleader for performance excellence, serving on AMG’s Governing Council, Health Outcomes Committee, and Advocate’s Executive Diversity Council.